Our booth is larger than most and can accommodate up to 8-9 people (with an all-time record of 12!). All of our booths feature the latest technology with a large touchscreen monitor, high resolution 10MP Digital Camera, and an external LCD monitor that allows for a customized message of your choice to display your brand, event or occasion! Most important, we only use a Photo Lab-Quality Sub Dye Printer and never an “ink jet” to print your projects. Our printers are HITI P510L Sub Dye Professional Event Printers and DNP DXRX1 ThermalPrinters that provide superb imaging! Besides, we already know that the end result is what truly matters…your smiles! Our newest booth fits 6 comfortably (max 8). Planning a Theme Party for your office? 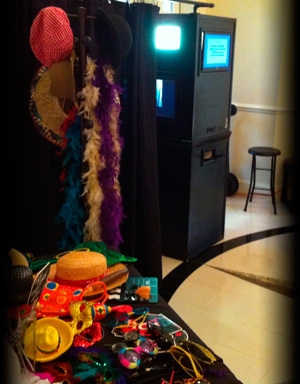 A Corporate Event Photo Booth Rental is ideal and provides the means to let your employees and guests have fun! What about a rental for a Wedding Reception? This is a great compliment to your DJ and photographer, and it takes a little pressure off of your Wedding Coordinator. This also will give you a great opportunity to entertain ALL of your guests! 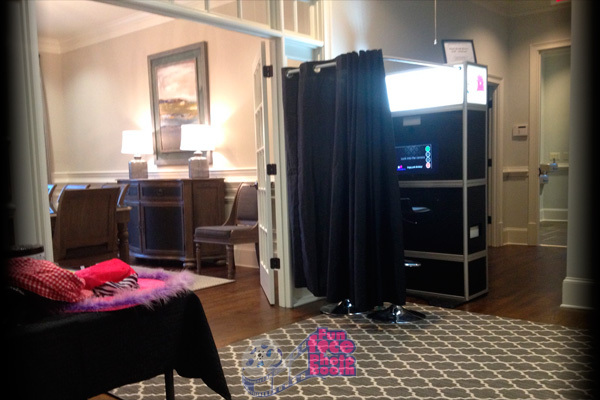 Whether the event is for someone 1 or 90… rent a Photo Booth for your next Birthday Party, for a child’s party with friends, or for you and adults to see the kid come out in you! You can’t go wrong. We have props to fit most events! And because our props* are free to use with the booth, it allows you to be that kid again, or get crazy with creativity with boas, hats, funny glasses ane more. The camera never judges, so let your hair down, cover your face if you like, and have the most fun you’ve had in years! Whether your next rental is for a Wedding Reception, Birthday or Theme Party, School Dance, Church Retreat, Family Reunion, Corporate Event or Awards Ceremony, or just to have fun with Fun Face Photo Booth; photo booth rentals are a great way to certainly entertain your guests while providing a memorable party favor they will never forget. Give us a call today to plan your next event! (*Rentals that are 4 hours or greater, props are included at no additional cost. For Rental periods that are 3 hours or less or at a discounted rate, we now charge a minimal fee of $40).